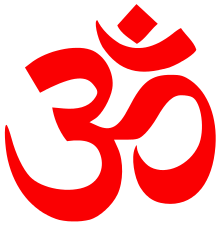 Śruti (IPA: [ʃrut̪i]) is Sanskrit for "that which is heard" and refers to the body of most authoritative, ancient religious texts comprising the central canon of Hinduism. It includes the four Vedas including its four types of embedded texts - the Samhitas, the Brahmanas, the Aranyakas and the early Upanishads. Śrutis have been variously described as a revelation through anubhava (direct experience), or of primordial origins realized by ancient Rishis. In Hindu tradition, they have been referred to as apauruṣeya (authorless). The Sruti texts themselves assert that they were skillfully created by Rishis (sages), after inspired creativity, just as a carpenter builds a chariot. Shruti differs from other sources of Hindu philosophy, particularly smṛti “which is remembered” or textual material. These works span much of the history of Hinduism, beginning with the earliest known texts and ending in the early historical period with the later Upanishads. Of the śrutis, the Upanishads alone are widely known, and the central ideas of the Upanishadic śrutis are at the spiritual core of Hindus. The Sanskrit word śruti (श्रुति) has multiple meanings depending on context. It means "hearing, listening", a call to "listen to a speech", any form of communication that is aggregate of sounds (news, report, rumor, noise, hearsay). The word is also found in ancient geometry texts of India, where it means "the diagonal of a tetragon or hypotenuse of a triangle", and is a synonym of karna. The word śruti is also found in ancient Indian music literature, where it means "a particular division of the octave, a quarter tone or interval" out of twenty-two enumerated major tones, minor tones, and semitones. In music, it refers the smallest measure of sound a human being can detect, and the set of twenty-two śruti and forty four half Shruti, stretching from about 250 Hz to 500 Hz, is called the Shruti octave. ^ Cite error: The named reference manusmriti2 was invoked but never defined (see the help page). ^ Cite error: The named reference manusmriti3 was invoked but never defined (see the help page). ↑ Michael Myers (2013). Brahman: A Comparative Theology. Routledge. pp. 104–112. ISBN 978-1-136-83572-8. ↑ Flood, Gavin. pp. 39. 1 2 Patrick Olivelle (2014), The Early Upanisads, Oxford University Press, ISBN 978-0195352429, page 3; Quote: "Even though theoretically the whole of vedic corpus is accepted as revealed truth [śruti], in reality it is the Upanishads that have continued to influence the life and thought of the various religious traditions that we have come to call Hindu. ↑ Kim Knott (2016). Hinduism: A Very Short Introduction. Oxford University Press. p. 12. ISBN 978-0-19-874554-9. Quote: There are different views among Hindus about which scriptures are shruti and which fall into the other important category of sacred literature, smriti, that which is remembered or handed down. ↑ Wendy Doniger (1988). Textual Sources for the Study of Hinduism. Manchester University Press. p. 2. ISBN 978-0-7190-1867-1. ↑ Gokul Chand Narang (1903). Message of the Vedas. Рипол Классик. pp. 39–40. ISBN 978-5-87256-097-5. ↑ "Shruti: The Four Vedas". 1 2 Hartmut Scharfe (2002). Handbook of Oriental Studies. BRILL Academic. pp. 24–29, 226–232. ISBN 90-04-12556-6. ↑ Wilke, Annette and Moebus, Oliver. Sound and Communication: An Aesthetic Cultural History of Sanskrit Hinduism (Religion and Society). De Gruyter (February 1, 2007). P. 495. ISBN 3110181592. ↑ Frits Staal (1996). Ritual and Mantras: Rules Without Meaning. Motilal Banarsidas. pp. 220–221. ISBN 978-81-208-1412-7.